HALF CHOKED in the dust raised by Kearney’s dragoons, a grim young lieutenant rode in silence. He saw no visions of rich cities to be conquered nor was he composing pretty speeches to be flaunted before the vanquished heathen. He was more concerned about his precious instruments. Jim Early had nearly allowed the instrument wagon to tip over in that last barranca. Confound these drivers! Why must they all drink so long of this New Mexican wine? He could hardly blame the fellow, though. What with the poor grub he gets in this army, the sight of good food and drink in the villages is enough to drive any man to excess. One consolation is that fellow Bestor—he guards the transit and chronometer with his very life. Thus Lt. Emory mused as he rode in the dust cloud kicked up by the remnant of the Army of the West. First Lieutenant William Hemsley Emory, chief engineering officer and acting assistant adjutant-general of the Army of the West was his full name and title. His classmates back at the U. S. Military Academy in 1831 had called him “Bold Emory” and he had liked that. Few people called him “Bill,” not even Matilda, his wife. His dignity and calm discouraged familiarity. But his associates knew Emory to be sympathetic and generous. Probably too much for his own good. So he covered up with a false front. There was small time for quiet thinking on this expedition. New problems were always coming up. The biggest troubles seemed to find their center in the head of the General. Not that he would permit himself the slightest disrespect of his superior. But the blunt man so frequently irritated his staff that he moved always in an atmosphere of friction and discord. After all, this might be an opportunity for a young man. Here he was 35 years old and so far he had not made a distinguishing mark in the army service. This expedition offered a chance for original scientific observation, a lot of high adventure in an unbroken country, and a brevet if he did a good job. And Matilda would be proud of him if he ever reached home again. He forgot for a moment it was his idea making this western trek—not Matilda’s. They had been married eight years ago and he had had a difficult time providing for the great-granddaughter of Benjamin Franklin in the style he would like to offer. But here it is time again to rush ahead and spot a campsite. And he must set up for a lunar observation; the General would probably order a full calculation tonight. Water was hard to find. It was early October and the tributaries of the Rio Grande were nearly dry. The summer of 1846 had been a severe drought season, the grass was a crisp brown, and the scant water holes were stagnant. It was indeed a bad year for an army of 1,660 untrained infantry and badly mounted cavalry to attempt the conquest of New Mexico and California. But the young chief engineer was expected to find campsites near water every night. So far his luck had held. But the Mexicans had told him about terrible wastelands between the Rio Grande and the Colorado where he would search in vain for water. The Army of the West, as motley a gathering of volunteers and regulars as ever graced a military expedition on this continent, had mustered at Fort Leavenworth in May and had crossed the prairies of Kansas and eastern Colorado during the summer. The brawny young United States government had declared war on Mexico and was seeking to lay its protective hand on the vast uncharted area known as New Mexico. The Yankee Dons in far-off California had also proven that the climate and natural resources of the great coastal empire were worth wresting from the hospitable Mexicans. So Kearney and his motley army were ordered westward on a double mission. The conquest of New Mexico was a farce. After vain sputterings and empty threats, General Armijo had flown south with his tiny army and a sizeable bit of property acquired during his lordly governorship. Kearney entered the city of Santa Fe with all the pomp and dignity he could muster from his ragged and weary army. Then followed a month of grandiose good-will speeches from roof-tops, a task which the General apparently assumed with relish. The vanquished residents welcomed the soldiers, offered barrels of wine and flocks of young bullocks. Kearney concluded his short governorship by dividing his army into several columns, leaving a garrison at Santa Fe, ordering Capt. Cooke’s Mormon Battalion to follow westward as quickly as possible, and assuming the lead of Maj. Sumner’s 300 dragoons toward ihe conquest of California. Here Lt. Emory’s real work began. He looked forward to the march with eagerness. Thus far he had made observations in territory much of which had already been described by pathfinding parties. Now he had much new work to do. He was official astronomer, draughtsman, geologist, meteorologist, botanist, diarist, and reporter of the expedition. His maps would give the government at Washington its first authentic information of the deserts and mountains of the great southwest. His sketches and specimens would give scientists their first knowledge of the Indians, animals, plants, and minerals of this vast unexplored region. He prepared himself thoroughly, determined to do a good job, without prejudice or error. Insubordination was not in Emory’s character; he was a good army man. No hint of his private thoughts about his chief crept into his reports. Controversial reports of Kearney at San Pasqual and of the Kearney-Stockton- Fremont incident were never given bias by the engineer. His work was with the immutable laws of Nature, the undisputable position of the stars in relation to his westward journey, and the thrilling discovery of new botanical classifications. Let the General get red in the face all he wished. After all, a man who had served in the War of 1812 about the . time the young engineer was first seeing the light of day was entitled, by virtue of his long military dictatorship on the western frontier, to his rages. Kearney was essentially a strict disciplinarian but his letters to his wife revealed he had another, gentler nature. Let modern historians debate on the quarrel between Kearney and Stockton, let them speculate on the guilt or innocence of Fremont, let them argue about the relative merits of the California lance in the hands of expert horsemen and the musket in the hands of weary and half-drunken dragoons. Not one of the recorders of history will question the trustworthy contribution which obscure Lt. Emory made to the lore of the southwest. In fact, few even mention Emory except to quote a sentence or two of his colorful language. For who is interested in the quiet plodding of a scientific man when there is a battle of tycoons in the offing? Two weeks out of Santa Fe, near the village of Socorro, the company of dragoons met Kit Carson and party, enroute east with dispatches telling of the subjugation of the Californians. Commodore Stockton was reporting that the empire had surrendered without loss of blood and “the American flag floated in every port.” Stockton’s extravagant optimism caused Kearney to send 200 of his dragoons back to Santa Fe, a third of his original force continuing westward. Much against Carson’s will, General Kearney pursuaded the famous scout to turn back and guide the party to California, a happy accident which extended Kearney’s life another two years and saved Emory’s reminiscences for the world. Kit Carson’s spectacular feat—with Lt. Beale—in bringing rescue to the butchered Americans at San Pasqual is an epic of California history. Emory’s keen powers of observation are evident in his report to the government, a book now difficult to find in print, which was published in Washington in 1848. The title of the narrative is “Notes of a Military Reconnaissance from Fort Leavenworth in Missouri to San Diego in California.” No diary ever sparkled more with humorous incident and quick grasp of essentials. Tables of astronomical figures, of little interest to the average reader, are safely tucked away in the appendix, leaving the narrative free for lucid description and crowning incident. A review of Emory’s notes would be an exhaustive commentary on the manners, morals, and foibles of the people he met, a vivid description of his company and the land through which he passed. He told a coherent story of a historic march without apparent attempt to draw biased conclusions. He was a reporter, not a critic. His reports of the battles fought in the “second conquest” of California are accepted as authentic. Emory was one of the busiest men in the company during the ten weeks’ journey from Santa Fe to Warner’s Ranch. The greater part of the trip was made in deserts which had never been mapped. The motorist who now travels the same distance in two days will find it difficult to understand the rigors of desert travel in 1846. Learning that Emory had time to observe an oak tree which now bears the name Quercus emoryii and that he took voluminous notes on other desert plants, the modern will increase his appreciation of Emory’s talents. The weary company finally passed through the California sierras and arrived at Warner’s, sensing that its journey was near an end. Emory joined the festivities and welcomed the entertainment and hospitality of Sailor Bill. He woke long before dawn on the fateful morning of December 6, 1846, to ride with General Kearney at the head of a battered column of fighters into the camps of Andres Pico’s California lancers. Surviving the two-day slaughter which marked the Golden State’s only disastrous military battle, he helped nurse the wounded and bury the dead. He carefully found time to take nightly observations of latitude and longtitude for his precious reports. When Kearney was severely wounded in the first encounter, it was Emory who led the charge on “Starvation Hill” in San Pasqual valley, the strongest position held by the Americans during the battle. Carson and Beale slipped through the Californian’s picket lines and brought back aid from San Diego. The shattered remnants of the Army of the West finally reached the edge of the Pacific and the end of their journey. Kearney reported the death of 18 men and the wounding of 13 more in a battle within a day’s walk of the port. And he had traveled more than eight months for this inglorious humiliation! 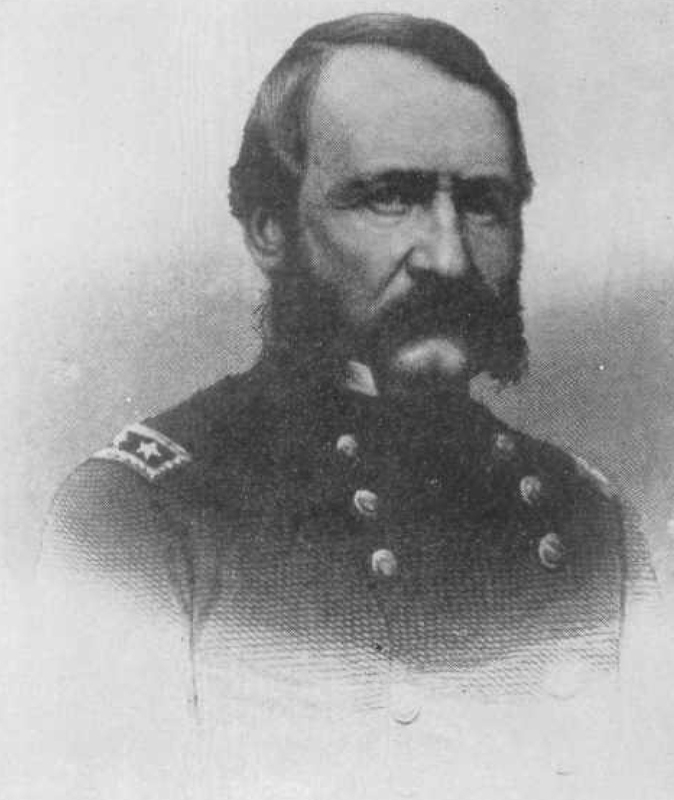 After a little delay, Commodore Stockton accompanied General Kearney with reinforcements of Navy men for an overland attack on the pueblo of Los Angeles. Emory joined the movement to make observations of the southern California terrain, reporting the two minor encounters with General Flores’ Californians. Fremont signed a peace treaty with Pico on January 13, to the discomfiture of Stockton and Kearney. Before the three-cornered fireworks had sputtered toward the explosion point, Emory had completed his preliminary plans for a fort in Los Angeles and had hurried back to San Diego, where he took a ship bound for the Isthmus, with his notes, sketches, and observations. Five days after Emory embarked, the ragged, exhausted Mormon Battalion, the company of 500 men under Capt. F. St. George Cooke, arrived in San Diego. Traveling on foot from Fort Leavenworth as a part of the Army of the West, the Mormons had been left far behind and did not sight the land they had come to conquer until two weeks after the ink was dry on the peace treaty. Junction of the Gila and Colorado rivers, as sketched by Emory’s artist in 1846. Picacho Peak is in the background. Taken from Emory’s report. Lt. Emory’s reconnaissance report ended at San Diego but his achievements in the southwest did not. The year his report was printed he was appointed by the President as chief astronomer of the boundary survey. In 1854 he received full power to establish the international line under the Gadsen Purchase. In three years he had completed the survey of the 46,000 square miles of desert in southern Arizona which marked the extension of United States territory. The engineer climbed in rank rapidly after that, receiving in succession commissions as major, lieutenant colonel, brigadier general, and major general. He retired from the army in 1876 after a service of 45 years. No doubt as an old man of 75 years, W. H. Emory often reviewed the dramatic and adventurous days with the Army of the West. If he could have lived to see the agricultural wealth on the upper Gil a, canals, highways, and railroads traversing the deserts he crossed, treacherous Salton Sink turned into verdant Imperial Valley—he would have been amazed and gratified. The thousands who are now reclaiming the desert areas he first mapped should place the name of Emory high among the men who “found” the southwest.